BIOMOR A.S.A.P. is a revolutionary floor degreaser formulated mainly for food service areas. 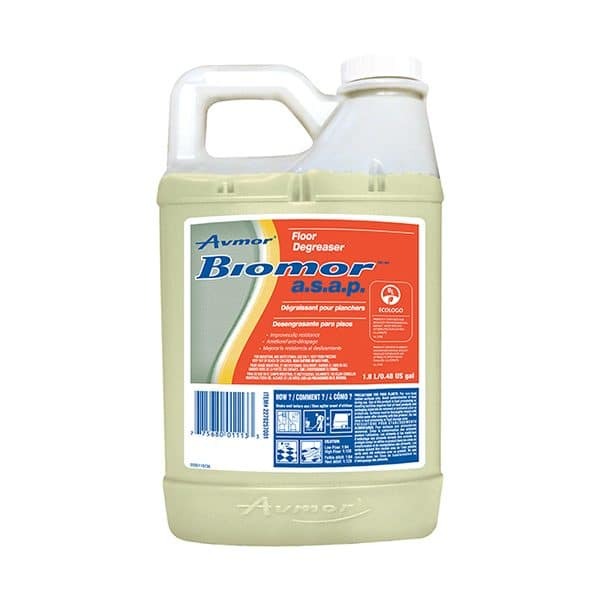 Using a proprietary blend of surfactants, biocleaning agents and bacterial spores, this formulation penetrates into the microscopic pores of the surface, cracks, corners, grout and other crevices where soils become very difficult to remove in restaurant kitchens and dining areas. 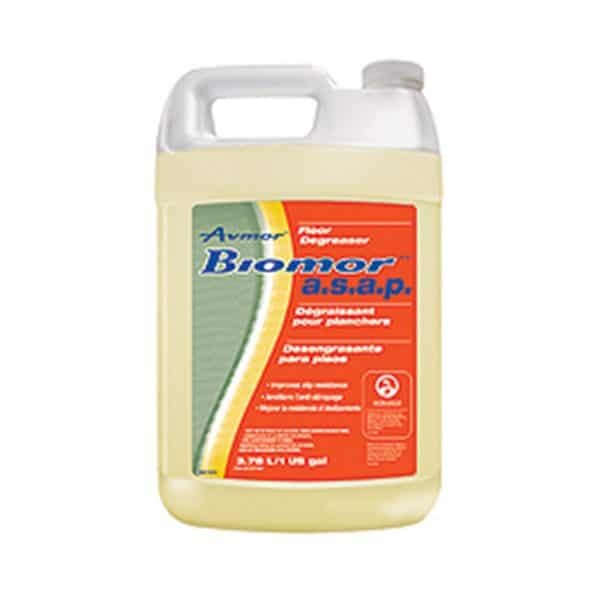 In order to maintain sustained effects, BIOMOR A.S.A.P must be of regular maintenance; the bio-cleaning agents will cling to the floor surface preserving a long-term deep cleaning activity by digesting grease and organic based soils. 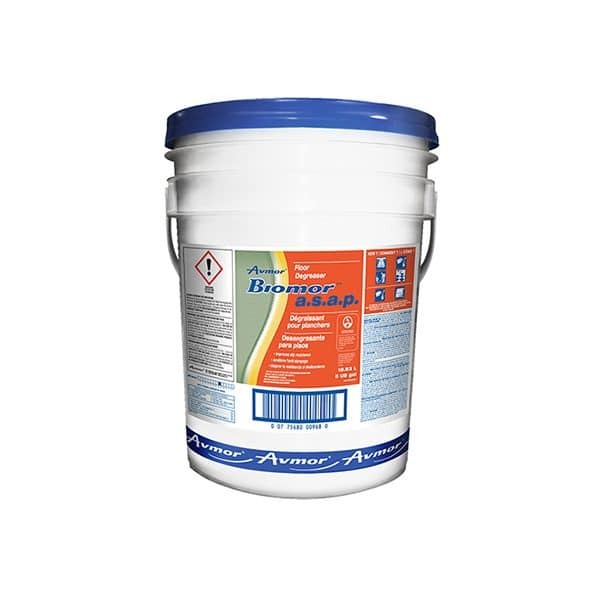 Floors subjected to BIOMOR A.S.A.P. will see a significant reduction in slippage and the grout will be restored to its original appearance. Floors are not only rendered safer for employees and patrons, but the residual cleaning helps to digest odour-causing bacteria resulting in a more pleasant working environment. BIOMOR A.S.A.P. is to be used on hard surfaces, such as quarry tiles, ceramic, concrete floors as well as on resilient tiles. 1. Dilute 1 part cleaner to 64 or 128 parts water (8-16 ml/l or 1-2 oz/US gal) depending on the soil. 3. Pick up excess solution. 4. You may also apply product “very wet” and let dry overnight. 1. Dilute 1 part cleaner to 32 or 48 parts water (30-45 ml/l or 4-6 oz/US gal). 2. Mop floor area, allowing 5 to 10 minutes dwell time. 3. Scrub the floor and pick up excess solution or let dry overnight. Daily cleaning is required in order to maximize residual cleaning effects. For more information, contact our Avmor representative.